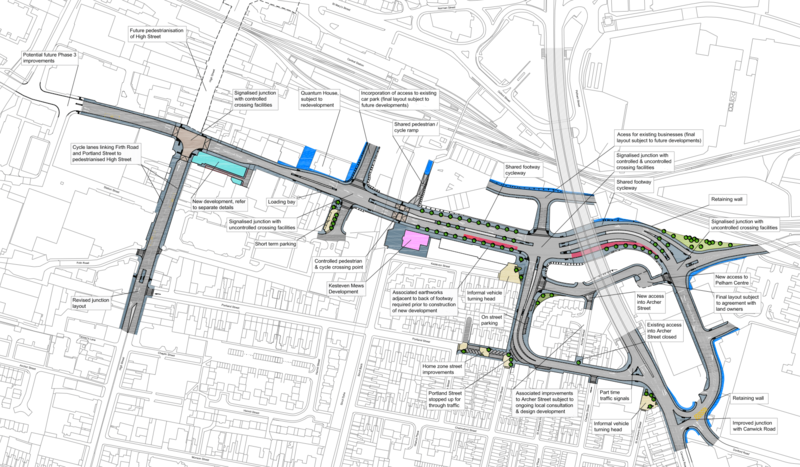 Plans have been submitted for the East West Link Road in Lincoln, a traffic relief road linking the High Street to Pelham Bridge and Canwick Road. In a three-week formal consultation period, people can comment on the the planning application for the first phase of the project. The proposed new road would be just south of the railway line and railway station, allowing traffic to flow east to west and vice versa. It would link the High Street to Pelham Bridge, by extending Tentercroft Street and constructing a new bridge over Sincil Dike. The £20 million link road is also intended to mitigate against the expected increased train barrier downtime, which holds back the lower end of the High Street. Senior Project Leader Les Davies said: “The new East West Link Road would make it much easier for traffic to move across the city. Vehicles can join Pelham Bridge, avoiding the level crossing. “This is increasingly important, with more barrier downtime expected in the near future. “In addition the road offers opportunities for economic growth and regeneration in the area, transforming the former coal yard into a new hub for local businesses. “People can enjoy a more pleasant shopping experience with the pedestrianisation of the High Street between Tentercroft Street and St Mary’s Street. The County Council is leading on the new road scheme, supported by the City of Lincoln Council, North Kesteven District Council and West Lindsey District Council. The application was submitted by the County Council’s Highways Department to its Planning Department. It has two parts, first a Conservation Area Consent seeking approval to demolish the existing buildings that form the south-east corner between the High Street and Tentercroft Street, and the second is a full planning application for the road and a replacement corner building. Phase 2 of the scheme is improvements to the Canwick Road area. Phase 3 is improvements between the High Street and Brayford Bridge. The application is expected to be determined at the County Council’s Planning and Regulation Committee later this year. Construction of the road and replacement building would take two years and could start in 2014.